Everyone deserves to laugh so hard that milk – or beer – comes out of their nose every now and then. But since it’s TodayTix Comedy Month, maybe every other day? 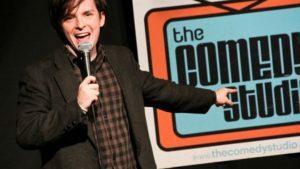 Anyways, we’ve rounded up 7 unique ways to get your LOLs on at comedy shows in Boston this month! Be ready for some smile lines to appear. 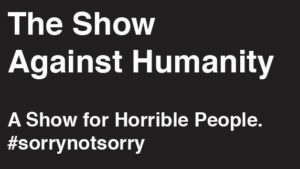 Your favorite naughty game just went next level with The Show Against Humanity at Improv Asylum! Every Friday night, cast members perform improv based on the hit card game Cards Against Humanity. We can’t promise that you’ll leave feeling like you’re a good person, but we can say that you’ll leave a laughing mess. Mondays are tough, we know. Take some pressure off your evening by snagging some food at The Supper Club while trying not to cry from laugher. Check out The Supper Club’s Monday comedy nights from 8-10pm every week if you’re down for some serious food and fun. Dinner and a show is always the way to go. Ruin your childhood the right way with Catalyst Comedy‘s Dirty Disney musical show! Dirty Disney is only held on select Friday nights at Laugh Boston, so make sure to get tickets in advance to ensure a magically hilarious night. These comedians will have you humming hilarious parodies of your favorite Disney ditties. Want to test your own improv skills? The Jam at ImprovBoston is the place for you! Every Sunday night at 6:30pm, you can sit in – or join in – on a 40-minute improv jam led by a professional, then catch a 20-minute performance by ImprovBoston’s National Touring Company. And with ticket prices at only $5, you can make all of your friends join in the jam. The Thursday Show at The Comedy Studio is simply laugh-tastic. 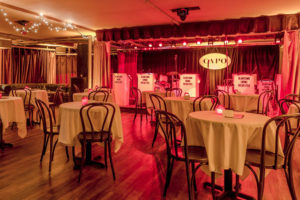 If you want an experience that’s not your typical comedy night, just know that this venue is at the top of the legendary Hong Kong Restaurant in Harvard Square. All we can say is you’ve got to check it out. Comedy and a cause…that’s music to our ears! 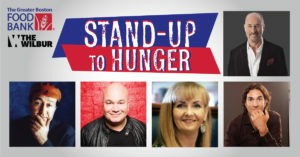 Stand-Up To Hunger at The Wilbur benefits The Greater Boston Food Bank and is guaranteed to be an amazing time. Clear out your August 17th schedule, get tickets, and be ready to do some good while laughing your little heart out. Last but not least, we’ve got Stories To Scenes, a monthly comedy show at The Riot Theater starring a renowned storyteller and tales of their life. After the storyteller does their thing, an improv group takes the stories and acts them out in a hilarious way that only improv masters can do. It’s two shows for the price of one, and it’s wicked fun! We hope your Comedy Month in Boston is full of happy tears and enormous grins. How are you getting your laughs in this month? Let us know on Twitter and Instagram!